Every fall for the last nine years, food lovers, farmers, and chefs have come together to celebrate local food and support CUESA at our annual Sunday Supper. The event raises much-needed funds for educational programs such as Schoolyard to Market, free market cooking demonstrations, low-cost kitchen skill-building classes, and scholarships to help farmers make their businesses more sustainable. But more than just a fundraiser, the event is an expression of the Ferry Plaza Farmers Market culture and greater Bay Area food community, forging and strengthening connections through collaborations between farmers, chefs, winemakers, and brewers. The seasonal ingredients on each of the six four-course menus are sourced from local farms, with chefs highlighting the growers they regularly support at the market. 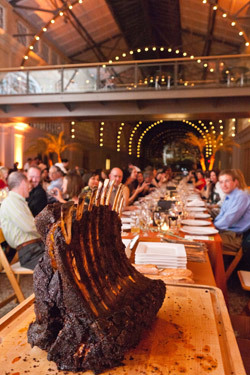 Each year, CUESA and our team of talented chefs strive to bring something new to the table. In 2010, we introduced the whole-beast feast, a tradition that continues this year with a single, sustainably sourced beast (or vegetarian entrée) serving as the centerpiece of each menu. This October 14, for the first time, we will offer an oyster bar from Hog & Rocks and Maverick owner Scott Youkilis. Having participated every year since 2007, Youkilis is one of more than 30 chefs who donate their time and skills to raise funds for CUESA at Sunday Supper. Like many chefs who have made the event an annual tradition, he values the spirit of community and collaboration that the Supper inspires. “It’s one of my favorite events of the year because we get to cook and hang out with all the best chefs in the city,” he says. Last year, he stepped up his involvement by becoming one of the six chef chairs. Each chef chair oversees a team of four chefs to create a four-course menu. Youkilis will be working with Melissa Perello of Frances, Emmanuel Eng of Maverick, Laurence Jossel of Nopa, and Melissa Chou of Aziza to create a seasonal meal centered on Jossel’s whole-pig entrée (sourced from either Devil’s Gulch Ranch or Riverdog Farm, both renowned for their pastured pork). 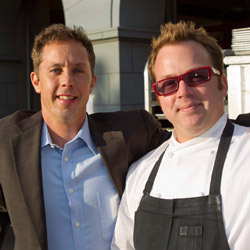 This year, Pierce will direct all of the pairings at the Supper, working with a new partner, Napa Valley Vintners. The organization has coordinated all of the event’s wine donations through their Napa Green Certified Land and Napa Green Certified Winery programs. 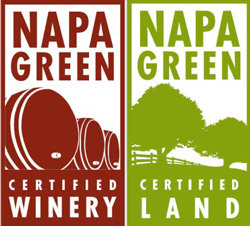 Napa Green has raised the bar for environmental standards in the local wine industry, placing a strong emphasis on improving water quality, minimizing use of chemicals, restoring natural habitats, and protecting soil from erosion through practices such as planting cover crops. Once a vineyard is enrolled in the program, it generally takes two or three years to meet the standards of certification. A third-party certifier works with each grower to develop a site-specific farm plan, and once the grower has been certified, they must be recertified every three years. The eight Napa Green wineries contributing to Sunday Supper range from the small-batch, certified organic vineyard Tres Sabores to the 40-year-old, family-owned 550-acre estate Trefethen. “It’s a blockbuster list of wineries,” says Pierce. “They represent a lot of different terroirs and areas of Napa Valley.” He believes that the bold Napa-style wines should create a “natural symbiosis” with fall menu items, such as root vegetables, mushrooms, and braised, smoked, and grilled meats. From the farms and vineyards to the kitchen and table, Sunday Supper is not only about good food and good wine, but also good community. For the chefs who participate, Sunday Supper is a way to give thanks to the growers, producers, and eaters who make the farmers market possible each week. Photos by Drew Altzier Photography.